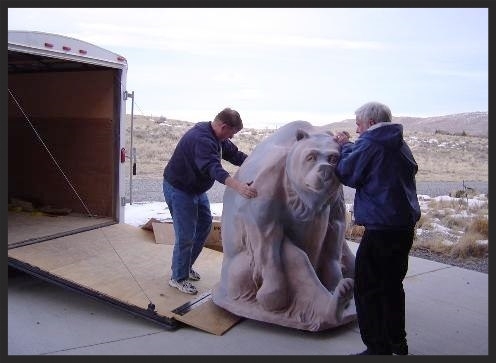 January 2008, the bear arrives and the first thought I had is, “He is one big bubba bear”. I said that many times in the next few days whenever I saw him. I started patting him on the nose and saying “Hi Bubba” whenever I went by, and that’s how he became Bubba. I always start with the eyes first whenever I do an animal, it makes them come alive and helps me know the direction in which to go. After his eyes, I did his nose and then the area around the eyes. Bubba was created by sculptor Jeff Rudolf who did a wonderful job making him look life like. The only trouble was all those grooves and crevices were impossible to mosaic so I filled them in with thinset. A ladder was needed to reach the top of the bear. 272 hours later and he is all done!!! I can hear the trailer coming up the driveway to pick him up. Bubba’s new home. 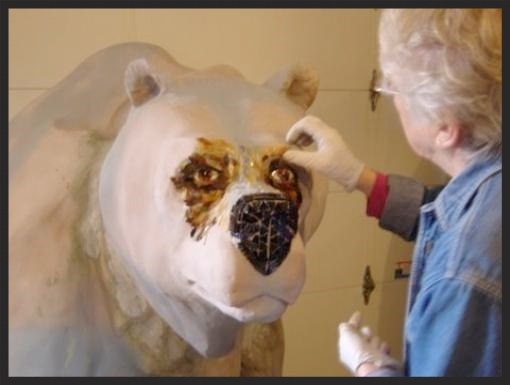 He was purchased by Groathouse Construction and donated to the new Cody library. Bubba makes the cover of the catalog!! !